If you fly in winter, you know just how annoying it can be when your take-off is delayed for obligatory de-icing. “The wait is justified,” insists ‘Futuris’ reporter Denis Loctier. The problem is that water droplets stick to aluminium surfaces. 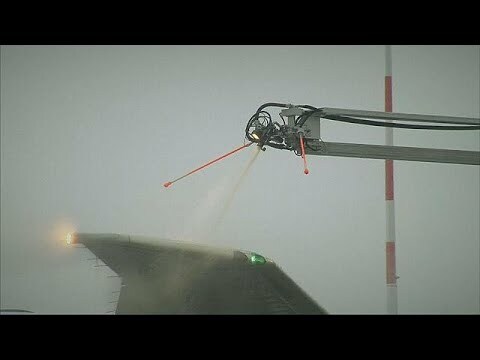 That’s how icy particles attach themselves to aeroplanes when it is cold and moist. Researchers are looking into how this can be prevented. “One of the solutions to avoid ice formation on the aircraft is to coat the elements with superhydrophobic coatings,” said Bartlomiej Przybyszewski, a Material Scientist from the Technology Partners Foundation. That is exactly what Polish scientists are doing in Warsaw. With international colleagues, they are working on a European research project called PHOBIC2ICE, conducted in cooperation with Canadian reseach and industrial organisations. One of their experimental coatings contains nanoparticles that make aluminium extraordinarily water-repellent and therefore icephobic. “Nanoparticles create spikes, and air is trapped between them,” Przybyszewski explained. Researchers are working on several ways of making surface materials icephobic. These cutting-edge technologies are inspired by a natural phenomenon known as the “lotus effect”. Lotus leaves don’t get wet thanks to their nanoscopic surface texture. So, when will aircraft makers start producing ice-repellent planes? Work at Airbus Central Research and Technology in Germany can help to answer that question. At the centre in Taufkirchen, an icing wind tunnel, made of wood for thermal insulation, shows exactly how ice develops on plane surfaces in simulated atmospheric conditions. “Basically, we’re creating an icing cloud inside this tunnel,” said Norbert Karpen, Icing Researcher at Airbus Central R&T. Cold water particles can turn into ice the moment they hit the plane. But it is not just about ice. What about other harsh conditions? “As an industry, we need to make sure that these coatings will not only be effective against icing, but also resistant to atmospheric agents like sand if we want to fly through a sandstorm, rain if we want to go through clouds, and ultraviolet rays,” explained Material Scientist Elmar Bonaccurso of Airbus Central R&T. So far, durability leaves a lot to be desired. Having to reapply the coatings too often would not be economically viable. However, with further research, icephobic coatings could be sufficiently improved to compete with current de-icing methods. “Right now, we have [to apply] heat — heating elements that we have to use, and they are not efficient, They use a lot of fuel,” said Jolanta Sapieha, Professor of Material Science at Polytechnique Montréal. It will take years of research, but in the end this technology could make chemical de-icing a thing of the past.